It's like everything we're writing about this week is about summer winding down. Yes, it's true, summer as we know it is coming to an end. But, there's still time to party! 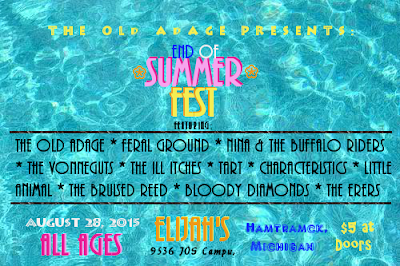 This Friday, August 28th head to Elijah's in Hamtramck for End of Summer Fest, featuring some of the best band's Metro Detroit has to offer and some out of towners. The lineup includes The Bruised Reed, The Vonneguts, Mover//Shaker, Tart, The ILL Itches, The Old Adage, Nina & The Buffalo Riders, Bloody Diamonds and Feral Ground. You can see all of these great bands for a measly $5. That's a pretty great deal! All ages are welcome. The party starts at 6 p.m. and music starts just before 7. Elijah's is located at 9536 Joseph Campau in Hamtramck. For more info on this fest, click here.